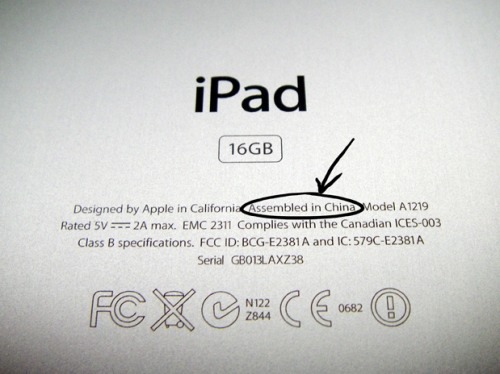 Apple has reportedly lost a trademark battle with a Chinese company that lawfully trademarked the 'iPad' name in 2000, reports the Financial Post. The Southern Metropolis Daily newspaper is citing court documents that indicate a Chinese patent court in Shenzhen rejected Apple's claim that Proview Technology was infringing on its trademark. Apple purchased the European rights to the iPad name from Proview's global parent last year for about $55,000 and filed an infringement lawsuit against the Shenzhen subsidiary six months ago, claiming the European deal also included China. While Tuesday's reported ruling suggests China's legal system does not agree, Apple officials did not immediately respond to a request for comment. Proview, having 400 million yuan ($64 million dollars) in debt, sued Apple in October for 10 billion yuan ($1.6 billion) in damages due to copyright infringement.